Boeing has delayed delivery of its 787 Dreamliner by six months, shortly after rather recklessly claiming it could dispatch the first example to All-Nippon Airways by May 2008 following a compressed flight test schedule. 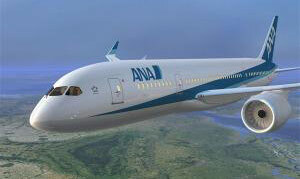 The Boeing Dreamliner in All-Nippon Airways livery. Some of the aircraft's suppliers describe this intended feat as "the aerospace equivalent of hitting a hole in one on a golf course", given that the Dreamliner's planned August 2007 maiden flight had already been put back to between mid-November and mid-December due to a "critical shortage of aerospace fasteners to hold the airplane together", as the Wall Street Journal explained. Back in September, and amid a former Boeing engineer's claims that the aircraft's composite fuselage had not been properly tested and posed a safety risk, company execs insisted they'd get a Dreamliner to All-Nippon on time. Now, however, it's admitted the first flight tests will not take place until Q1 2008. In a statement yesterday, Boeing cited "ongoing challenges with out-of-sequence production work, including parts shortages, and remaining software and systems integration activities" as the multiple causes of its woes. Scott Carson, president and CEO of Boeing Commercial Airplanes, lamented: "While we have made some progress over the past several weeks completing work on our early production airplanes and improving parts availability across the production system, the pace of that progress has not been sufficient to support our previous plans for first delivery or first flight. We deeply regret the impact these delays will have on our customers, and we are committed to working with them to minimize any disruption to their plans." Jim McNerney, Boeing chairman, president and chief executive officer, offered: "We are disappointed over the schedule changes that we are announcing today. Notwithstanding the challenges that we are experiencing in bringing forward this game-changing product, we remain confident in the design of the 787, and in the fundamental innovation and technologies that underpin it."